Feast your eyes on the randomly-generated lower deck crew. They will die often. Now that I’ve finished work on the lower decks, I can start seriously on COMBAT MONTH. Though maybe not until tomorrow morning. 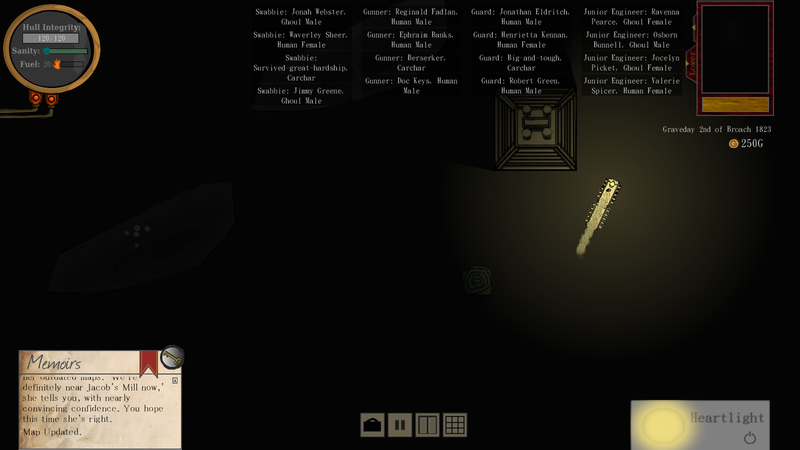 Tonight I’m adding a few essential tweaks to the random event system. But for the purposes of this devlog, such concerns are a long way in the future. As last time, I will be taking you back in time. We’ll catch up soon, I promise, and then we can talk about the lower decks in a little more detail. Diving back into these prior versions of my game has been a fascinating process. It’s very much like archaeology – I’m peeling back layers and layers of the past, and discovering things I had forgotten. In this update, I’ll be going through Version 0.2 from distant February. So what do I find when I boot up V0.2? Why isn’t there a space between “Dark” and “House?” I have literally no idea. Well, we have a title screen, for a start. 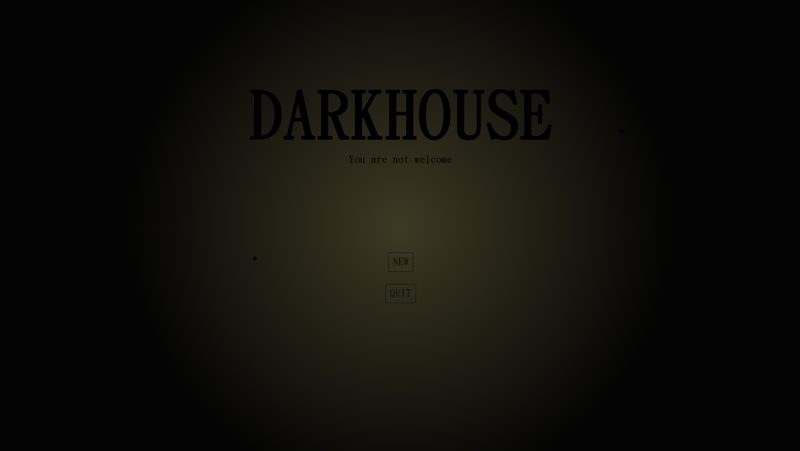 Apparently I’m still trying to make “Dark House” work as a title. Give it up, Past Me. Stop trying to make “Dark House” happen. It’s not going to happen. The game’s current title-screen still looks a lot like this early version, though I now consider it very much a placeholder. You can’t see it in the image above, but the title-screen’s light flickers randomly, and there are ashes drifting from the top. This was my first foray into particle effects, and it’s for an entirely useless feature that doesn’t even look that nice. I’m hoping to make use of particles a little more effectively during COMBAT MONTH. I have some better ideas for how the title screen could look when HOMR is finally released, but I can’t waste time on that while I could be working on the main game. Speaking of which, what was the main game like in V0.2? And from the person who brought you that last stuff, I give you – more of the same! 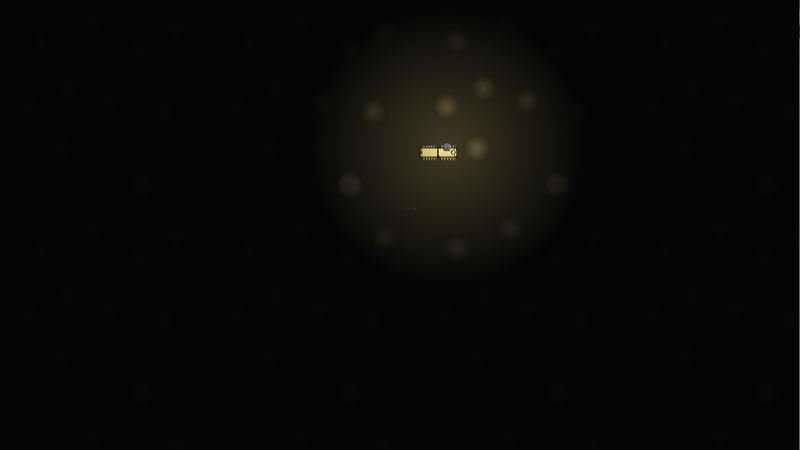 Okay, so now the player starts in the middle of the screen. Apart from that, it looks pretty damn similar to what we had a week ago. Wow, Past Harry, what the hell have/had you been doing since then? Is the title-screen really all you have/had to show for yourself? It’s difficult to convey stasis in a picture. Trust me, things were moving and now they aren’t. Turns out I’d been working on a pause system. The pause screen you see above is very similar to the one I have now – except now it has other options like Save, Load, Main Menu, etc. But in terms of the code making it happen, the pause screen has never been changed, and yet so far has worked flawlessly. It has the downside that every pausable object needs to establish that it’s pausable in the very first line of code – essentially, telling the computer not to bother even reading the code if the player has paused the game. If I don’t remember to put this line in, which happens all the time, then while all the other objects stand perfectly frozen on screen the errant object will drift around aimlessly like a weird untethered balloon trapped in a static hellscape. But when I don’t make dumb mistakes like that it works, and it works well, and that’s the important thing. I think the week or two I spent working on pausing was when I really realized how much I enjoyed programming – I’d expected coding a pause system to be deathly boring, but with Tom Francis’s videos as an essential springboard, I found myself enjoying it immensely. For something as boring as pausing the game! 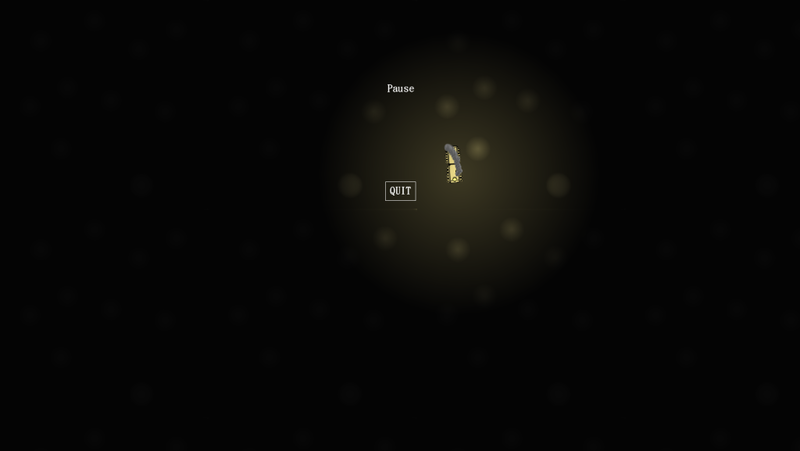 I had no idea, by the way, that I’d implemented the pause system so early on in the process! I don’t know why I thought it was more important than, er, literally everything else. Past Harry is a baffling enigma. Do not attempt to comprehend Past Harry. I haven’t cracked open V0.3 yet, and now I have no idea what to expect. We can get into that next week and explore my past mistakes ~together~. And in the meantime: first week of COMBAT MONTH. Combat is going to be an entirely different game mode, which requires a whole new world of code. I can’t wait. As always, for more up-to-date dev progress, check out my Twitter at @pixeltrickery.